The Centaur is a family of rocket stages. They are designed to be the upper stage of space launch vehicles and is used on the Atlas V. Centaur was the world's first high-energy upper stage, burning liquid hydrogen (LH2) and liquid oxygen (LOX). Centaur has enabled the launch of some of NASA's most important scientific missions during its 50-year history. Centaur was the brainchild of Convair employees Karel Bossart (the man behind the SM-65 Atlas, an intercontinental ballistic missile (ICBM)), and Krafft Arnold Ehricke. Their design was essentially a smaller version of the Atlas, adopting its use of lightweight "stainless steel balloon" tanks whose structural rigidity was provided solely by the pressure of the propellants within. To keep the tanks from collapsing before the propellant was loaded, they were either kept in "stretch" or pressurized with nitrogen gas. Existing Centaur stages are powered by one (Single Engine Centaur variant) or two (Double Engine Centaur variant) RL10 rocket engines. The upcoming Centaur V will have an increased diameter powered by two RL10 engines. The Centaur was originally designed for use with the Atlas launch vehicle family, which shared its balloon structure. Known in early planning as the "high-energy upper stage", its eventual name was proposed by Ehricke, who was directing its development for General Dynamics. In recognition of the mythological half-man-half-horse Centaur, the horse portion represented the "workhorse" Atlas as the "brawn" of the launch vehicle, while the man represented the "brain" of the combination in the Centaur. Initial Atlas-Centaur launches used developmental versions, labeled Centaur-A through -C. The first launch on May 8, 1962, ended in an explosion 54 seconds after launch when insulation panels on the Centaur failed and caused the LH2 tank to rupture. After extensive redesigns, the next test on November 26, 1963, was successful. On May 30, 1966, an Atlas-Centaur boosted the first Surveyor lander towards the Moon. The soft landing of Surveyor 1 in the Ocean of Storms was NASA's first landing on any extraterrestrial body. :92 This was followed by six more Surveyor missions over the next two years, with the Atlas-Centaur always performing as expected. These missions demonstrated the feasibility of reigniting a hydrogen engine in space, a capability vital to Apollo, and provided information on the behavior of LH2 in space. By the 1970s, Centaur was fully mature and had become the standard rocket stage for launching larger civilian payloads into high Earth orbit. In addition, it replaced the Atlas-Agena vehicle for NASA planetary probe missions. The U.S. Department of Defense meanwhile preferred to use the Titan booster family for its heavy lift needs. By the end of 1989, the Centaur-D had been used as the upper stage for 63 Atlas rocket launches, 55 of which were successful. In 1975, Titan-Centaur launched the Viking 1 and Viking 2 spacecraft to Mars. The original plan was to launch them on Saturn V rockets:154 as the Vikings were the most massive interplanetary missions to date, with each including an orbiter and a lander. These missions were highly successful, with the Viking 1 lander operating until 1982, and were the only NASA missions to study Mars until the Mars Global Surveyor was launched in 1996. These launches were followed by the 1976 launch of Helios 2, another West German-U.S. solar probe that flew closer to the Sun than Helios 1. Helios 2, until beaten by the Parker Solar Probe, held the record for the highest speed of any spacecraft, with a heliocentric velocity of 70 kilometres per second (43 mi/s; 250,000 km/h; 160,000 mph) at its closest approach to the Sun. The Titan-Centaur's next two launches were the Voyager 1 and Voyager 2 spacecraft. Voyager 1 visited Jupiter and Saturn. Voyager 2 completed the "Grand Tour" of the outer planets by visiting Jupiter, Saturn, Uranus, and Neptune. A once-in-175-years alignment of those planets allowed gravitational assists to boost the probe from one planet to the next. 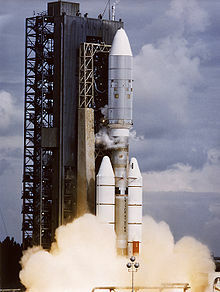 Voyager 2 was launched on August 20, 1977, followed 16 days later by Voyager 1. Voyager 2 is still the only spacecraft to have visited Uranus and Neptune. Voyager 1 is the first spacecraft to have entered interstellar space. While the Titan-Centaur that launched Voyager 2 performed flawlessly, the Titan booster used to launch Voyager 1 had a hardware problem that caused a premature shutdown. The Centaur stage detected and successfully compensated for this problem, although Centaur ended its burn with less than 4 seconds of fuel remaining. :160 This was the final launch of the Titan IIIE-Centaur. With the introduction of the Space Shuttle, NASA and the Air Force needed an upper stage to boost shuttle payloads out of low Earth orbit. The Centaur-G was developed for this purpose, with both Challenger and Discovery being modified to carry the stage. To enable its installation in shuttle payload bays, the diameter of the Centaur-G's hydrogen tank was increased to 14 feet (4.3 m). The diameter of its oxygen tank, however, remained at 10 feet (3.0 m). During its first mission on May 16, 1986, a Centaur-G was to have boosted the Galileo probe towards Jupiter. Just six days later, another Centaur-G would have boosted the Ulysses probe towards Jupiter where it eventually - with an IUS - used the planet's gravity to reach a highly inclined solar orbit to observe the Sun's polar regions. A shortened version of the Centaur-G was planned to be used on shuttles carrying payloads for the U.S. Department of Defense and for boosting the Magellan probe to Venus. During the development of the shuttle in the 1970s, NASA debated whether to use a solid-fueled Inertial Upper Stage (IUS) instead of a Centaur. An IUS was much lighter and safer than a Centaur. NASA was concerned, however, that the rough starting and extremely fast acceleration of a solid rocket motor could damage payloads. Unlike a Centaur, an IUS could not be turned off once ignited. In addition, an IUS was less capable than a Centaur, which meant that a shuttle would have to carry less complex payloads. However, the presence of several tons of volatile liquid hydrogen and oxygen on a shuttle was concerning, especially because no Centaur had been designed as a human-rated vehicle and lacked the safety features of both a shuttle and a Saturn upper stage. NASA was especially worried about a shuttle having to make an emergency landing with a fully fueled Centaur in its payload bay. The Centaur's weight would exceed the design capacity of the shuttle's landing gear, and there was no safe and reliable method for dumping the Centaur's fuel before the shuttle landed. In its favor, the Centaur had an excellent reliability record in recent years. As of April 1981, when the first shuttle flight occurred, a Centaur had failed to operate only twice in the 35 launches during the previous decade. Still, several astronauts were wary about flying a shuttle with a Centaur in its payload bay, and a few[who?] flat-out refused to do it. Ultimately, NASA decided that shuttles could carry Centaurs. Their superior performance and smoother engine starts versus an IUS were too important to disregard. Additionally, the Air Force needed a Centaur's extra power to launch its satellites during classified military shuttle missions. Another important factor was that the Titan-Centaur launch vehicle was the only alternative for planetary missions. The problem was that the Air Force controlled those vehicles, and two decades of those entities sharing a launch vehicle had proven that bad blood always resulted. After the Challenger accident, and just months before the Shuttle-Centaur was scheduled to fly, NASA concluded that it was far too risky to fly the Centaur on the Shuttle. Galileo, Ulysses, and Magellan were boosted by the much less powerful solid-fueled IUS, with Galileo needing multiple gravitational assists from Venus and Earth to reach Jupiter. 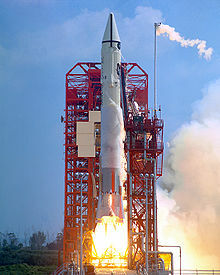 Both versions of Atlas III used Centaur variants. Atlas IIIA used the Centaur II upper stage, developed for the Atlas II series. Atlas IIIB used a new version, Common Centaur. The Atlas V rocket currently uses the Common Centaur variant. In 2014, on the NROL-35 mission, Atlas V's Common Centaur first flew in a reengined configuration with an RL10-C-1 replacing its previous RL10-A-4-2. This engine is meant to be common between Centaur and the Delta Cryogenic Second Stage to reduce costs. RL10-A-4-2 will continue to be used on some future flights. Atlas V launches using the Dual Engine Centaur configuration must use RL10-A-4-2 because the new engine is too wide to accommodate two side-by-side. To date, all Atlas V launches have used the Single Engine Centaur variant, however CST-100 Starliner and Dream Chaser missions will require the dual engine variant, because it allows a "flatter" trajectory which is safer for aborts. As on Titan-Centaur, Atlas V 500 launches encapsulate the upper stage inside the payload fairing, to reduce aerodynamic loads. Atlas V 400 flights carry the fairing on top of Centaur, exposing it to the air. The new Vulcan launch vehicle currently being developed by United Launch Alliance will initially fly with an upgraded variant of the Common Centaur stage flown on Atlas V known as Centaur V, before later upgrading to the new "Advanced Cryogenic Evolved Stage", which will include the Integrated Vehicle Fluids technology to allow long on-orbit life of the upper stage measured in weeks rather than hours. When the new ULA successor to the Atlas V was initially announced in 2015, it was slated to initially use a Centaur upper stage, but no mention was made at that time about an upgrade to a newer version. Centaur uses so-called "balloon tanks", made of stainless steel so thin they cannot support their own weight without pressurization. This tank design, with walls as thin as 0.03 inches (0.76 mm), allowed for an extremely high ratio of fuel to dry mass, maximizing the stage's performance. It uses a common double-bulkhead to separate the LOX and LH2 tanks. The two stainless steel skins are separated by a 0.25 inch (6.4 mm) layer of fiberglass honeycomb. The extreme cold of the LH2 on one side creates a vacuum within the fiberglass layer, decreasing the bulkhead's thermal conductivity, and thus reducing heat transfer from the relatively warm LOX to the super cold LH2. Attitude control and ullage are provided by means of hydrazine monopropellant thrusters located around the stage. There are two 2-thruster pods and four 4-thruster pods, sixteen in total, fed from a pair of bladder tanks carrying 340 pounds of hydrazine. Tank pressurization, as well as some engine functions, use helium gas. The main propulsion system consists of one or two RL10 engines. These engines can be restarted multiple times, given sufficient power, helium, and ullage propellant, allowing Centaur to perform complex orbital insertions and deorbit burns. Common Centaur, on Atlas V, can accommodate secondary payloads using its Aft Bulkhead Carrier, a mounting fixture on the rear end of the stage, near the engine. Centaur-D was the first Centaur version to enter operational service. Centaur II was initially developed for use on the Atlas II series of rockets. It was also used on the Atlas IIIA. In late 2017, ULA decided to bring elements of the ACES upper stage forward and begin work on Centaur V. This upper stage would be expanded to the same 5.4-meter (18 ft)-diameter of Vulcan core, using a cluster of four LH2/LOX engines (BE-3U or RL-10), but not include the Integrated Vehicle Fluids (IVF) feature expected with ACES. Bringing critical items from ACES to Centaur V, at this time, is expected to increase the lift capacity of the first generation Vulcan, so it can carry planned national security payloads. Centaur V would permit ULA to retire both the Atlas V and Delta IV rocket families on a faster schedule. By March 2018, ULA had begun to publicly refer to the new Vulcan first stage with the Centaur V second stage as the Vulcan Centaur. In May 2018 United Launch Alliance (ULA) announced that Aerojet Rocketdyne RL10 upper stage engine was selected for ULA’s next-generation Vulcan Centaur rocket following a competitive procurement process. As of 2009[update], derivatives of the 10-foot-diameter (3.0 m) Centaur-3, with one RL-10A4-2 engine, continue to be used as the upper stage of the Atlas V EELV rocket. There is an option to fly the Atlas V with a two engined Centaur, which is planned to be used for launches with the CST-100 Starliner and Dream Chaser. United Launch Alliance (ULA) had been working on an upper stage design concept that would bring the Delta and Centaur stages together into a single new cryogenic second stage design, called the Advanced Common Evolved Stage, was originally intended as a lower-cost, more-capable and more-flexible upper stage that would supplement, and perhaps replace, the existing ULA (Lockheed Martin legacy) Centaur and the ULA (Boeing legacy) Delta Cryogenic Second Stage (DCSS) upper stage vehicles. ACES design conceptualization has been underway at ULA for many years, and leverages design features of both the Centaur and Delta Cryogenic Second Stage (DCSS) upper stages. With the decision to discontinue both the Delta IV and Atlas V lines by the 2020s, ULA also abandoned work on replacing their upper stages. ACES will continue to be developed, and will be deployed on Vulcan. May 8, 1962: Centaur weather shield separated early; stage exploded. Footage of this was used in the film Koyaanisqatsi. June 30, 1964: RL-10 hydraulic actuator pump shaft broke, preventing one of the two RL-10 engines from vectoring. This led to no roll control, and uncovering of LOX inlet. December 11, 1964: Restart attempt failed, due to problem with ullage rockets. April 7, 1966: Centaur did not restart after coast — ullage motors ran out of fuel. August 10, 1968: Centaur restart failed. May 9, 1971; Centaur guidance failed, destroying itself and the Mariner 8 spacecraft bound for Mars orbit. Feb 11, 1974: Titan-Centaur; boost pump failed. June 9, 1984: Centaur LOX tank failed; no restart. April 18, 1991: Centaur failed due to particles from the Scouring pads used to clean the propellent ducts had gotten stuck in the turbopump, and while not offering much resistance, it was enough to stop the critical start-up procedure. April 30, 1999: Launch of the USA-143 (Milstar DFS-3m) communications satellite failed when a Centaur database error resulted in uncontrolled roll rate and loss of attitude control, placing the satellite in a useless orbit. June 15, 2007: the engine in the Centaur upper stage of an Atlas V shut down early, leaving its payload — a pair of National Reconnaissance Office ocean surveillance satellites — in a lower than intended orbit. The failure was called "A major disappointment", though later statements claim the spacecraft will still be able to complete their mission. The cause was traced to a stuck-open valve that depleted some of the hydrogen fuel, resulting in the second burn terminating four seconds early. The problem was fixed and the next flight was nominal. Performance levels for a planned Evolved Centaur based Phase 1 vehicles envelope all Atlas V capabilities. In certain circumstances a single Atlas booster vehicle with five solids and with an evolved Centaur upper-stage can replace a three-booster core Atlas V-Heavy (HLV). This has obvious reliability and cost benefits. Phase 2 vehicles open the door to a vastly higher performance capability. Up to 80 metric tons can be lifted to low earth orbit on a Phase 2 HLV vehicle — a substantial fraction of a Saturn V or SLS vehicle. This performance level, mandated only by NASA crewed exploration missions, can be achieved using hardware identical to that used for traditional commercial and USG missions thus allowing development and support costs to be diluted by rate. Studies have been conducted showing the extensibility of the basic Centaur and Evolved Centaur designs to long duration space flight for exploration purposes and even for use as a Lunar Lander. Complementing these basic performance capabilities is the ability to rate the vehicle for crewed operation. Extensive work has been conducted showing that achieving this "man-rating" is straightforward and does not mandate wholesale design changes to the Centaur vehicle. By 2006, Lockheed Martin Space Systems had described the ability to use existing Centaur hardware, with little modification, as a test bed for in-space cryogenic fluid management techniques. Most Centaurs launched on Atlas have excess propellants, ranging from hundreds to thousands of pounds, which could be used for "rideshare" experiments flown as secondary payloads conducted after separation of the primary spacecraft. In October 2009, the Air Force and United Launch Alliance (ULA) performed an experimental on-orbit demonstration on a modified Centaur upper stage on the DMSP-18 launch to improve "understanding of propellant settling and slosh, pressure control, RL10 chilldown and RL10 two-phase shutdown operations. "The light weight of DMSP-18 allowed 12,000 pounds (5,400 kg) of remaining LO2 and LH2 propellant, 28% of Centaur’s capacity," for the on-orbit demonstrations. The post-spacecraft mission extension ran 2.4 hours before executing the deorbit burn. The initial mission demonstration in 2009 was preparatory to the more-advanced cryogenic fluid management experiments planned for the Centaur-based CRYOTE technology development program in 2012–2014 and to a higher-TRL design for the Advanced Common Evolved Stage Centaur successor. ^ "Altas V Launch Services User's Guide" (PDF). United Launch Alliance. March 2010. Retrieved July 9, 2015. ^ a b Krebs, Gunter. "Centaur". Gunter's Space Page. ^ Helen T. Wells; Susan H. Whiteley; Carrie E. Karegeannes. "I. Launch Vehicles". Origin of NASA Names. NASA Science and Technical Information Office. p. 11. ... because it proposed to make first use of the theoretically powerful but problem-making liquid hydrogen as fuel. ^ a b c d e f g h i j k l Dawson, Virginia P.; Bowles, Mark D. (2004). Taming Liquid Hydrogen: The Centaur Upper Stage Rocket 1958–2002 (PDF). NASA. ^ Berger, Eric (December 11, 2018). "Getting Vulcan up to speed: Part one of our interview with Tory Bruno". Ars Technica. Retrieved December 12, 2018. Centaur 3 (which flies on the Atlas V rocket) is 3.8 meters in diameter. The very first Centaur we fly on Vulcan will go straight to 5.4 meters in diameter. ^ "VULCAN CENTAUR". United Launch Alliance. 2018. Retrieved December 12, 2018. ^ "Atlas Centaur LV-3C Development History". ^ Helen T. Wells; Susan H. Whiteley; Carrie E. Karegeannes. "I. Launch Vehicles". Origin of NASA Names. NASA Science and Technical Information Office. p. 10. ^ "What are the fastest spacecraft we've ever built?". io9.com. Retrieved July 26, 2014. ^ Harold J. Kasper; Darryl S. Ring (1980). "Graphite/Epoxy Composite Adapters for the Space Shuttle/Centaur Vehicle" (PDF). Scientific and Technical Information Division of the NASA Office of Management. p. 1. Retrieved December 15, 2013. ^ Mangels, John (December 11, 2011). "Long-forgotten Shuttle/Centaur boosted Cleveland's NASA center into manned space program and controversy". The Plain Dealer. Cleveland, OH. Retrieved December 11, 2011. ^ "Titan 4 Launch". Archived from the original on July 8, 2008. ^ a b c d Thomas J Rudman; Kurt L Austad (December 3, 2002). "The Centaur Upper Stage Vehicle" (PDF). Lockheed Martin. ^ "Atlas V NROL-35 Launch Updates". Spaceflight 101. December 13, 2014. Retrieved September 9, 2016. ^ a b Rae Botsford End (December 13, 2014). "new RL10C engine debuts on classified NROL-35 launch". Spaceflight Insider. Retrieved September 9, 2016. ^ a b "America, meet Vulcan, your next United Launch Alliance rocket". Denver Post. April 13, 2015. Retrieved April 17, 2015. ^ a b Gruss, Mike (April 13, 2015). "ULA's Vulcan Rocket To be Rolled out in Stages". SpaceNews. Retrieved April 17, 2015. ^ Stiennon, Patrick J. G.; Hoerr, David M. (July 15, 2005). The Rocket Company. American Institute of Aeronautics and Astronautics. p. 93. ISBN 1-56347-696-7. ^ "Aft Bulkhead Carrier Auxiliary Payload User's Guide" (PDF). United Launch Alliance. ^ a b "Centaur Upper Stage Family". ^ Erwin, Sandra (March 25, 2018). "Air Force stakes future on privately funded launch vehicles. Will the gamble pay off?". SpaceNews. Retrieved June 24, 2018. ^ Bruno, Tory [@torybruno] (March 9, 2018). "Internally, the current version of Centaur flying atop Atlas is technically a 'Centaur III.' Since we are only flying one Centaur at present, we've just call it 'Centaur.' Vulcan will have an upgraded Centaur. Internally, we refer to that as the 'Centaur V'" (Tweet). Retrieved December 12, 2018 – via Twitter. ^ "Sierra Nevada books first launch for 'space SUV'". Spaceflight Now. Archived from the original on February 9, 2014. Retrieved January 28, 2014. ^ a b Zegler, Frank; Bernard Kutter (September 2, 2010). "Evolving to a Depot-Based Space Transportation Architecture" (PDF). AIAA SPACE 2010 Conference & Exposition. AIAA. Archived from the original (PDF) on October 20, 2011. Retrieved January 25, 2011. ^ a b Wade, Mark. "Titan". Encyclopedia Astronautica. Retrieved December 12, 2018. ^ Pyle, Rod (2012). Destination Mars. Prometheus Books. pp. 73–78. ISBN 978-1-61614-589-7. Mariner 8 launched in May but failed early in flight and ended its mission by splashing into the Atlantic Ocean. ^ "The Space Review: Launch failures: an Atlas Groundhog Day". www.thespacereview.com. Retrieved November 17, 2018. ^ MILSTAR 3 — Description. ^ a b Craig Covault (July 3, 2007). "AF Holds To EELV Schedule". Aerospace Daily & Defense Report. ^ Justin Ray. "Atlas Rocket Team Ready for Wednesday Satellite Launch". Spaceflight Now. ^ Justin Ray. "AV-011: Mission Status Center". Spaceflight Now. ^ Sakla, Steven; Kutter, Bernard; Wall, John (2006). "Centaur Test Bed (CTB) for Cryogenic Fluid Management". NASA. Archived from the original on June 19, 2009. ^ Successful Flight Demonstration Conducted by the Air Force and United Launch Alliance Will Enhance Space Transportation: DMSP-18 Archived 2011-07-17 at the Wayback Machine, United Launch Alliance, October 2009, accessed 2011-01-23. ^ Propellant Depots Made Simple Archived February 6, 2011, at the Wayback Machine, Bernard Kutter, United Launch Alliance, FISO Colloquium, 2010-11-10, accessed 2011-01-10. ^ "Atlas V 551". Retrieved April 21, 2015.